You and I have misjudged a sandwich or two in our lifetimes haven’t we? I found out just the other day that I’m not too old for a P.B.&.J.. It was delicious! I also learned recently that, for years, I’ve been misjudging the B.M.T. This is typical, but it certainly doesn’t have to happen. The B.M.T. isn’t at all like the B.L.T. You’ve no doubt had a B.L.T. sandwich. You probably found it to be delicious, mostly because of the B, the L, and the T.
If you’ve just recently arrived here from another country, or are here gathering information about our planet for The Big Giant Head, B.L.T. Stands for Bacon, Lettuce, and Tomato- the key ingredients in the sandwich. The B.L.T. isn’t just an easy nickname to remember, it’s also fun to say out loud. 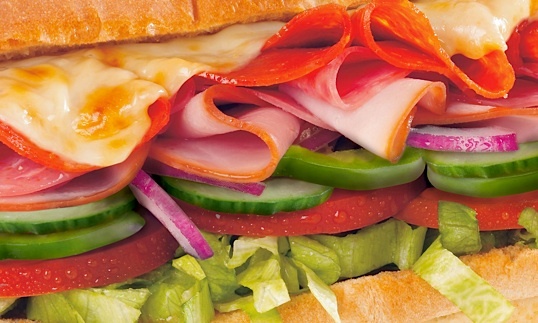 The Subway Italian B.M.T. is the sandwich chain’s number one selling sandwich… Although most people would be hard pressed to explain exactly what the B, the M, and the T, stand for. Customers who have ridden the New York Subway system would immediately recognize the words as something other than a series of seemingly random words, pressed together to create the name of something that sounds more like a 1970’s vocal group than a sandwich. As Subway restaurant chains began spreading across America faster than a colobus monkey virus, the company changed the sandwich’s name to “Biggest, Meatiest, Tastiest” in response to the more outmoded moniker. The idea was that loyal customers could still order by the initials. The problem is that customers unfamiliar with the new sandwich chain, yet familiar with the B.L.T. were left to assume that the initials had something to do with the ingredients. This is why the typical suburban American has a difficult time explaining exactly what is inside one of America’s favorite sandwiches. Which of course brings me to the local church. Since the typical “church going” protestant American will change churches many times over the course of their life, often without changing their home address, they will arrive in your church prepared to compare and contrast their current experience against their past experiences. That baggage amounts to expectations of how your church will operate and perform. …who has a different theology than you . …who doesn’t worship alongside you. …who doesn’t understand what your church is trying to accomplish or how you are hoping to accomplish it. …Which is why church growth that comes from church transfer is usually both initially exciting, and detrimental to your church over the long haul. This is why it’s essential for any church to have effective, and easily identifiable process to help new attenders discover what the church believes, hopes to accomplish, and how it is attempting to accomplish this. You’re telling them up front, what your B.M.T. is, where they can find it, and how God has called you to make it. This will allow them to know right away whether not they are in the right place. If you don’t do this, they will be left to figure out whether or not they are in the right place by judging the accommodations, music, and teaching style against their discriminating tastes. Which is typically what happens, but certainly doesn’t have to. Thanks Darcy, we are so grateful for you guys! I agree with you on the expectations, I’ve found that God usually shows up where I least expect him… mostly because of my expectations. SO true, I hope you guys find a great church!